« GORDON BANKS CONFIRMS, WITHOUT PICKLES ENGLAND WOULDN’T HAVE WON THE WORLD CUP. 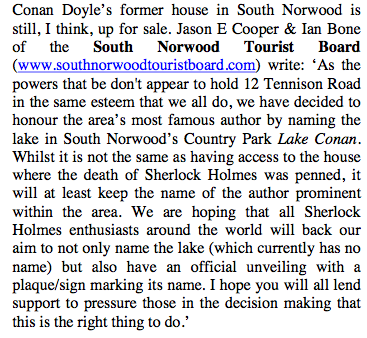 Thank you Roger Johnson, author and editor of The Sherlock Holmes Journal, who has backed our campaign and published details in the latest ‘The District Messenger’; THE NEWSLETTER OF THE SHERLOCK HOLMES SOCIETY OF LONDON. “This is the best introduction to Sherlock Holmes that I know and it also serves as a valuable work of reference. Written by two experts, presented with wit and published as an attractive hardback at a very modest price – there’s no better bargain for the beginner or the regular reader.” -Amazon reader review.